Jack and Hazel fit together. Not like romantic-fit — they are in fifth grade, after all — but with Jack, Hazel — who is often the odd child, the imaginative child, the one who doesn’t quite fit in anywhere — belongs. Really belongs. So, when Jack suddenly stops talking to her, she’s beyond hurt. She’s devastated. She wants to stop living. And yet, she’s the only one who can help Jack: his heart has been turned to ice by the Snow Queen (“Like in Narnia?” “No. Narnia is like her.”) and Hazel is the only one with enough imagination (and courage) who can go save him. Hazel sets off, somewhat prepared, into the woods and the fairy tale. 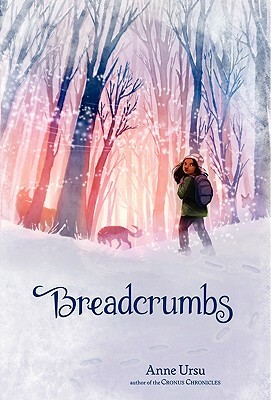 It’s a cross between Stephen Sondheim’s Into the Woods, and Neil Gaiman’s Instructions: Hazel finds herself not only in the tale in which she needs to confront and rescue her friend from the Snow Queen, but in various other tales as well. There’s an element of Wrinkle in Time, in that Hazel doesn’t quite fit in and yet she’s the only one who can Do what needs to be Done. For some reason — it may just be where I was — I found this book beautiful, truly, honestly, and simply beautiful, and yet impossibly sad. I didn’t so much want to read an adventure about Hazel as hold her and help make her deeply-felt insecurity go away. There was hope in the end — there always is, in this kind of the story — but I still finished it feeling quite sad for Hazel. Even so, it’s a wonderfully told fairy tale. So is this a retelling of Hanzel and Gretyl? I'm always very leery about fairy tale retellings – they are defintiely not my favorite genre. This one sounds like it might be something I'd want to read, though. Actually, Amanda, it's not. It sounds like it should be, but it's more a play on the Snow Queen fairy tale than anything else. I had to return this to the library. Someone else wanted it… I am going to request it again, though. I really want to read it. I loved this, for a lot of reasons – it is just beautiful, gorgeously written and it places an entirely new spin on notions like friendship, loyalty, identity. But I do get what you mean about sad. There's a thread of melancholy through this one, though it worked for me.